Several months ago, I found the most amazing website. It became a regular break from the from the pressures of everyday life. It was dceaglecam.org. 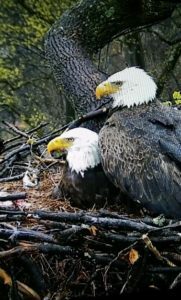 Via webcams the site featured a wild eagle family nesting in a tall Tulip Poplar tree at the National Arboretum in Washington. This ‘first family’ of bald eagles, a mated pair named “Mr. President” and “The First Lady” were mesmerizing to watch as they prepared their nest, laid their eggs, fed their hatchlings and raised them until the eaglets grew strong and healthy. Before our eyes, in living color, bold and beautiful Bald Eagles flew to and from their nest, gently hovering over their eaglets, keeping them warm, safe and well fed. Their teamwork was flawless as they flew in with fresh fish (mostly the male), feed their young (both parents), keep the nest clean and free of debris (mostly the female) and carried in fresh branches (he brings she arranges!). Amazingly their distinct gender roles, with the male as the main food provider and the female as the main caregiver, were surprisingly traditional. The First Lady sat on the nest more often, fed and cleaned the eaglets and slept on the nest during the night. Mr. President however was never very far, always alert and eager to feed the eaglets when on the nest, which is more than some women can say about their mates! Along with thousands of chatters across the world, I logged on to the chatrolls as expert moderators discussed and explained eagle behavior. I realized that many others were as emotionally involved, fascinated and invested in this nest of Bald Eagles as I was. This year the pair raised two eaglets who were named Freedom and Liberty. The eggs were laid in February 2016 and the eaglets fledged in June. I watched as they grew from tiny, wobbly hatchlings to large fledglings standing as tall as their parents. It was my great good fortune to witness a miracle such as this. I hope that the pair will return again to this nesting site in January so write it on your calendars, watch for my postings and get ready to plug in your laptops, turn on your smartphones and log on to watch this miracle of nature with me. I can assure you I’ll be watching! Never Underestimate the Power of SUPERCAT! So, for those of you who hold dear to the concept that cats do not develop attachments to their ‘people,’ take a look at that cat video now going viral. In live action, the clip captures a devoted tabby rushing forth to her ‘boy’s’ rescue and sending a biting dog scurrying for its life! What a wonderful clip! I love that cat! Summoning up feline courage from her instinctive self, she takes on a canine villain three times her size! Good for you Kitty! You rescued your boy, drove off the offending pup and elevated the lowly lap cat to the role of national hero. Which reminds me (here’s my subtle segue) of a situation I had years ago when my children were small and my Siamese, Rajah, performed a similar act of heroism. Described in my short story, THE HERO, published in the Veterinary College of Ontario’s book Animal Companions, Animal Lovers and Animal Doctors, in June 2012, Rajah exhibits pure feline heroism as he mobilizes explosive feline powers to rescue his family and his Keeshond from a huge marauding Shepard mix. The incident will live forever in my mind as a sterling example of unique animal powers that defy stereotypes, amazing us with their breadth and courage! So the next time you see a kitty curled up in the sun or strolling through the grass, look again. You may be looking at the next incarnation of SUPERCAT whose exploits rival those of our comic book human superheroes! Glancing at my Humane Society calendar I was pleased to see that June was “Adopt a Shelter Cat Month.” The picture is of a little orange tabby kitten chewing on a blanket and looking adorable. This kitty looks ‘for all the world’ like one of those kitties who makes you laugh, gets into everything and ends the day napping on your lap. What could be better? As we know, homeless animals are a tragic reality throughout the world as are homeless people. As a volunteer with Golden Retriever Rescue I have housed and cared for dozens of homeless dogs and have seen first-hand the kind of problems that result. Food aggression, separation anxiety and resource guarding are just a few of the problems homeless abused or neglected dogs can present. As a social worker I have seen the result of homelessness, poverty and financial insecurity with people as well as animals and its impact is devastating. Physical and emotional problems abound resulting in increased social problems like communicable disease, crime, child abuse, domestic violence and teen pregnancy to name just a few. Fortunately most of us have never had to face being homeless but think just for a minute how it would feel not to have a home. What would that be like? There would be no place to go where you can close the door on the outside world, where you can keep your things and eat and sleep and feel safe. Just think for a moment how that would feel. Don’t go to what you would do to avoid it or how you would get out of it but just what it would feel like. Now let those feelings guide your actions in whatever way you think is right. Homelessness for people and animals is a crisis in this country with no easy social, political or financial solutions. If you were a raccoon in the forest, a lizard in the desert or a beaver in lake you would make or find a home for yourself. Home is just that basic. Whether it’s a hole in a tree, a den. a cave. a nest or a dam it would be what you think of as home. Homeless domesticated animals don’t have those options; they don’t have that instinctive drive to hunt and nest and do all the things wild animals do to survive. To a large extent that’s because we humans bred it out of them. We domesticated them, made them depend on us for food and shelter and then we abandoned them. Somewhere along the line, if you look at homeless people, much of the time you will see that something similar occurred. Through no fault of their own, as a result of mental illness, addiction, immigration or social misfortune, these people became unable to care for themselves, live with a family, remain gainfully employed. Abandonment is not the answer in any case, so getting back to kitties and calendars… if there’s room in your home and your heart for a homeless animal, why not go get one? And if we’re talking about homeless people and the broader social issues that confront us as a country, the first step would be to learn more about the problem and the second step would be to find a way to get constructively involved. The more we get involved the more likely these problems will begin to be resolved. The storms passed and it was a beautiful clear day. Low 70’s with lots of sun and a slight breeze. Daisy was ready for her run and like any normal Golden Retriever nothing made her happier! One of the city’s open space areas presently clear of ball games, bike riders and skateboarders allowed us the perfect opportunity. I unhooked her leash and threw her ball. Off she ran pure joy emanating from her flowing golden coat, tongue lolling, ears flapping, feet flying. It’s at times like these that I can most fully appreciate the natural order of things. She was created to be the dog she is and as a dog she is fully in the moment, fully alive doing what she loves to do: chase, retrieve and jump, track down interesting smells, roll in the occasional poop, dunk in the occasional mud puddle and race headlong into the occasional flock of geese! And at the end of her wonderful run she loves to get a cookie and a big bowl of fresh water! What could be better? Oh, and always listen to whoever is holding your leash! My second lucky break into the world of publication occurred shortly after the first meeting I attended of the Maryland Writers’ Association. I was lucky to be present when Vonnie Winslow Crist was the presenter, reading some excerpts from her book The Greener Forest. At that time Vonnie also talked about THE GUNPOWDER REVIEW, a literary magazine she co-edited with Wendy Hellier Stevens. THE REVIEW specializes is works submitted by female writers in Maryland. She let us know that she would be accepting short stories and poems for the next few weeks. Elated I rushed home and turned on the computer! I had written several short stories about animals and after a few revisions I was happy to send her a copy of “Buck and the Lady in the Lake,” featuring my first greatly loved Golden Retriever, Buck. After doing some of her own editing, Vonnie accepted the story and it was included in THE GUNPOWDER REVIEW 2011 edition! I was happy to be invited to launch the publication at a book reading held at Barnes and Noble in Bel Air in November of that year. Many thanks to Vonnie and the Gunpowder Branch of the National League of American Pen Women for their efforts in creating this wonderful beautiful assembled collection of works by Maryland women authors and artists. The magazine is available at Lulu.com and Amazon.com. If you get the chance to read “Buck and the Lady in the Lake,” I would love to hear your comments! I have always been an animal lover and through the years have had and loved many animals of different species. Through the course of my life with my animals inevitably many situations arose, some funny, some tragic, some heart-warming. I always knew I’d write about my life with animals but it seems I needed a little impetus to get started. That impetus came through a series of some simple exchanges. I was having a conversation with a 7th grade teacher friend wherein she was describing an assignment she had given her English students. The assignment had to do with stories about unlikely heroes. Within moments I was telling her my ‘unlikely hero’ story. It was about my cat Rajah, a Siamese who indeed rose to hero status years before in an unlikely series of events. She was enthralled by my story so I told her I’d write so she could share it with her students. I wrote the story, she shared it and the students loved it! I called the story “The Hero.” And that was when I became a writer of animal short stories. Serendipity dipped in a bit later when an author cousin of mine emailed me a link to a website for the Ontario Veterinary College. The announcement, a Call for Submissions, announced that in honor of their 150th year anniversary, The Veterinary College planned to publish an anthology of animal stories. I submitted “The Hero” and it was accepted for inclusion in their book entitled: Animal Companions, Animal Doctors, Animal People which was published in 2012. It seems fitting that Rajah, my first beloved Siamese, led my first foray into the world of publication! The book is available through Amazon.com and if you get the chance to read “The Hero” I would love to hear your comments! I’m the new gal on the block. Mom just adopted me from Golden Retriever Rescue. We’re both glad that I’m here now. She loves me and kisses me a whole lot. I’m still getting used to the way things are done around here. I used to live somewhere else but now I live here. I like it pretty well. I’m a really good sport, daaaa what would you expect I’m a sporting dog! I love everyone. Big and little people other dogs and believe it or not I really like those cats too…especially Tahji he’s pretty wild and likes to hang out with me. Talia is pretty shy still but I’m not going to hurt her except if I step on her by accident…. really. I love to run and play, ball especially. I’m a great retriever, another daaa what would you expect, right? I love to carry things stuffed toys around in my mouth and get petted. I love to be petted so the more people who come to visit the better it is for me. I’m smart and good. I love to go for walks and rides in the car and eat my dog food. Well I like to eat any food but mine is what I get the most. I’m Tahji and I’m handsome, long-haired and part Siamese. I run this place! There’s lots of things to do for a cat like me. I have to make sure I get all the bugs that come in the house and look out the window to keep all the birds and squirrels in their place. And speaking of keeping things in their place, that fat girl cat who lives here now, well I spend a lot of time putting her in her place. I like to chase her. And I lick her to keep her clean and then I bite her if I can get away with it. Truth is I like to bite PERIOD. It’s fun. I think of it as nibbling but Mom doesn’t like it too much, she calls it biting. Hi I’m Talia — as you can see I’m a beautiful fat kitty. I’m one of those cats people call a ‘lap cat’, but you have to have a pretty big lap for me! I love to be petted and I purr and purr. I love my cat food too and I meow in a special way that makes everyone run to get me my cat food! I’m pretty convincing. Sometimes I get extra meals that way. My Mom got me from a shelter and I’m really glad that she did. My cage was really small there and I didn’t like staying there. I like it here pretty good except for my brother cat who can be really bossy. He likes to start licking me and then gets carried away and starts biting me! Then I yowl really loudly and my Mom yells “No! Tahji Bad Cat” at him and he runs away. My Mom loves me a lot. She thinks I’m a good Kitty. I look at her with my big GREEN eyes and she just melts. I love to sit on her lap so she can brush me. I have long fur and it keeps her busy getting the tangles out. We have this big dog who lives here now too. That dog makes a lot of noise when she’s running around I get worried that she’ll step on me so I run away really fast. I can move faster than you’d think I could. Oh and one other thing, I like feet and shoes. Well, I love them really. Mom says I have a shoe fetish, whatever that is. I roll on people’s shoes, and put my paws in them and sleep on them. I guess I’m just a girly girl with a shoe fetish.